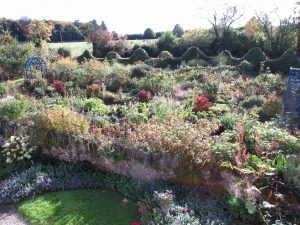 Established in 2005, our garden has featured in the Farmers Journal, Irish Times, Irish Independent, Jane Powers’ book The Living Garden, and RTE’s Nationwide and Dermot’s Secret Garden as well as French and German TV. It covers approximately 1 acre. It is not a show garden, rather a working kitchen garden, which is dedicated to teaching. It is, in the words of owner, Tanguy de Toulgoët, “not a display garden but a garden in progress”. Tanguy follows traditional gardening methods and believes in the importance of value in biodiversity and sustainability. He holds gardening and natural beekeeping courses on Saturdays. Tanguy keeps bees at Dunmore Country School, and therefore grows plenty of flowers for bees to feed on, such as Nepeta Six Hills Giant, Leonorus Cardiaca . Green manures phacelia, buckwheat, mustard clover and flower mixes are grown. Herbs are also grown including absinthe, angelica, various types of mint,hyssop, savory, etc. This garden overflows with fruit and vegetables. A range of vegetables are cultivated such as Japanese squash, courgettes, asparagus and cardoon as well as unusual produce like sweet potatoes . 22 varieties of tomatoes are grown and Tanguy grows 35 varieties of roses. A selection of berries fruit in the garden; tayberry, gooseberry, blackberry, blackcurrant and the unusual white blackcurrant are used to make jam for the kitchen. There are amazing features such as minarettes, cordons and bended trees. Tanguy saves a lot of seeds. Unusual plants: Ribes Nigrum Alba, rumex montana, swiss mint. Admission Fees: €8 per person. Groups of 10 – 20 only. Facilities: No. Not wheelchair accessible. Gardening tools sales. Refreshments: Available by request to groups. Children: Children are welcome but must be supervised at all times.